Cheapys.com - Cheap Nintendo Games and So Much More! => Cheapys.com - Cheap Nintendo Games and So Much More! Cheapys.com Sells Cheap Nintendo Games, as well as Portable CD Players, Portable AM/FM Radios, Clock Radios, MP3 Players, and So Much More! Cheapys.com Price - $285.99, Plus Shipping and Handling. 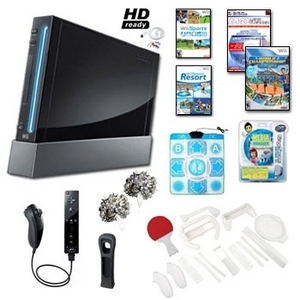 The sleek Wii console, no larger than a stack of several DVD cases, includes a Nintendo Wii game console (black), Wii Remote Plus controller (black), Nunchuk controller (black), the original Wii Sports, Wii Sports Resort, wired sensor bar, power cord, standard composite cable, console stand, console manual. Click Here For More Information ~ On All Our Nintendo Games.